HARRISBURG – Rep. 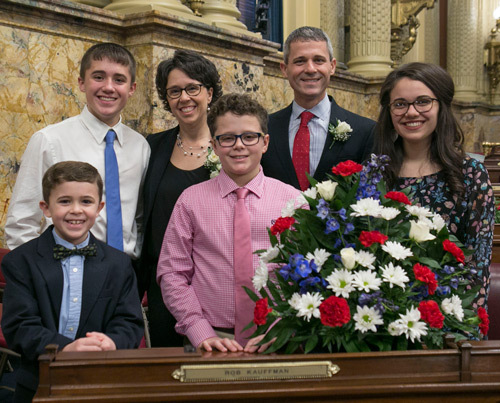 Rob Kauffman (R-Franklin) was sworn into office this week to begin his seventh term representing the citizens of the 89th Legislative District in the Pennsylvania House of Representatives. In addition, he was named chairman of the House Labor and Industry Committee for the 2017-18 legislative session by Speaker of the House Mike Turzai (R-Allegheny). The Labor and Industry Committee addresses legislation that helps shape Pennsylvania’s business climate and laws governing Pennsylvania’s workforce. Issues the committee deals with include unemployment compensation, workers’ compensation, the Prevailing Wage Act, the Child Labor Law, the Uniform Construction Code, plant closings and mass layoffs, and apprenticeship and job training. The 2017-18 legislative session is the 201st of the Pennsylvania General Assembly. Rep. Rob Kauffman, pictured with his family, was sworn in as state representative of the 89th Legislative District on Jan. 3. He was also named chairman of the House Labor and Industry Committee on Jan. 5.